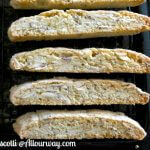 A basic biscotti recipe that can be built upon. The biscuits are hard and crunchy but not hard to eat. The almonds are lightly toasted and there is ample flavor added to the ingredients. Adjust oven rack to middle position and heat oven to 325 degrees. Using pencil and ruler, draw a 12 by 6 inch rectangle on a piece of kitchen parchment. Spray kitchen parchment with vegetable oil spray on unmarked side and place it pencil side down on baking sheet. Pulse the 1 cup of almonds in food processor until coarsely chopped, 8 to 10 pulses; transfer to bowl and set aside. Add flour, baking powder, and salt; process to combine, about 15 seconds. Transfer flour mixture to second bowl. Process 2 eggs in now empty food processor until lightened in color and almost doubles in volume, about 3 minutes. With processor running, slowly add sugar until thoroughly combined, about 15 seconds. Add melted butter, almond extract, and vanilla and process until combined, about 10 seconds. Transfer egg mixture to medium bowl. Sprinkle half of the flour mixture over egg mixtures and, using spatula, gently fold until just combined. Add remaining flour mixture and chopped almonds and gently fold until combined. Using floured hands, form the dough into a 12 by 6 inch rectangle using the penciled lines as a guide. Spray the loaf lightly with oil spray. Using rubber spatula lightly coated with oil spray, smooth tops and sides of rectangle. Using a sharp knife coated with oil spray, cut the loaf in half making it into two- 3 by 12 inch loaves. Separate loaves leaving 2 inches between them Gently brush tops of loaves with egg wash. Bake until loaves are golden and just beginning to crack on top, 25 to 30 minutes, rotating pan halfway through baking. Let loaves cool on baking sheet for 25 minutes. Transfer loaves to cutting board. Gently spray water on top of loaf and on a serrated knife. Slice each loaf on a slight bias into 3/4 inch-thick-slices. Lay slices, cut side down, about 1/4 inch apart on a wire rack set in a rimmed baking sheet. Bake until crisp and golden brown on both sides, about 35 minutes. Let cool completely before serving. Biscotti can be stored in an airtight container for up to 1 month or frozen until ready to serve.